Tickford Australia and Ford Tickford Engineering discontinued in Australia in 2002, when its parent company, Tickford, in England was purchased by Prodrive. 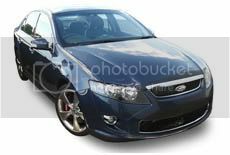 Ford Tickford Experience (FTE) was replaced by the company, Ford Performance Vehicles, a joint company between Ford Australia, and Prodrive. Standing 400m - 14.16 seconds. F6 Typhoon, Force 6, F6 Tornado. GT, GT-P, Force 8, Pursuit, Super Pursuit. GT, GT-P, GT E, Pursuit, Super Pursuit (2008). GT, GT-P, GT E (2010).